Room treatment is paramount to good sound with any system. That's a fact. But often, the stuff costs as much as the electronics you're using. That's what makes these foam squares so appealing. More importantly, this room treatment works. Rather than let the sound from your speakers slap against your walls, simply treat your room with these squares for incredible diffusion results. Call our audio experts at 800-716-3553 for ideas about placement. I bought one and received it a few hours. The biggest thing is that I want to play my few records all over again. It is like for the first time. It seems louder at the same preset volume point and a lot more direct and focused. I definitely want to buy at least 4 more. For the price it is worth a try. Maybe it as much a difference as upgraded gear. I ordered 8 foams for my dedicated room and they worked fantastic! I thought my room was fairly neutral with about a dozen Echo Buster products scattered around, but since adding the Acoustech Foam Ruffles Squares to the bare spots on my walls, the music has reached a new level of focus and clarity. The bass is punchier, the highs are light and airy and the vocals are crisp and clear. Lyrics that were formerly indistinguishable are no more. Oh. It's "I fear the monkey in your soul"! 3. B22 Pro Panels 2"x2"x1"
9. 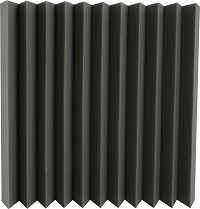 B22 Pro Panels 2"x2"x1"